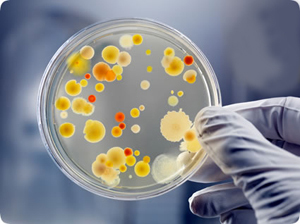 Microorganisms are very tiny one-celled organisms, that are divided into 3 main categories - viruses, fungi, and bacteria. They are found everywhere in the world - in the air we breathe, on our skin, on our food and even inside our body. In fact There are more microorganisms on and inside your body than there are cells that make up your entire body. Microorganisms can live in the air, on land, and in fresh or salt water environments. Some of them, pathogens, can be harmful and causes diseases, but there are some microorganisms that are needed for living things to survive and are also beneficial to us as humans. A great summary of the Microorganisms standard ! 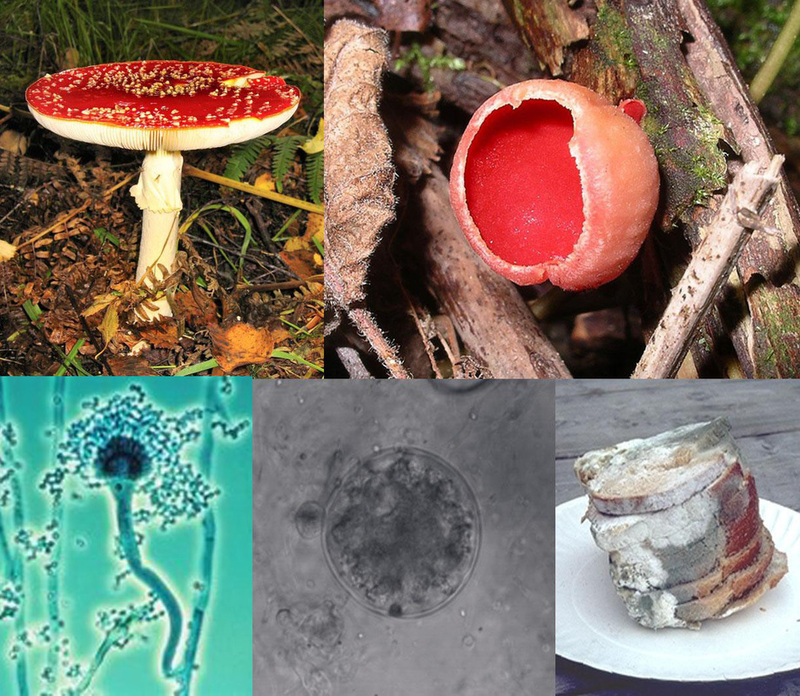 Most Fungi we know of, are those that we can see with the human eye such as mushrooms, toadstools, yeast and mould. 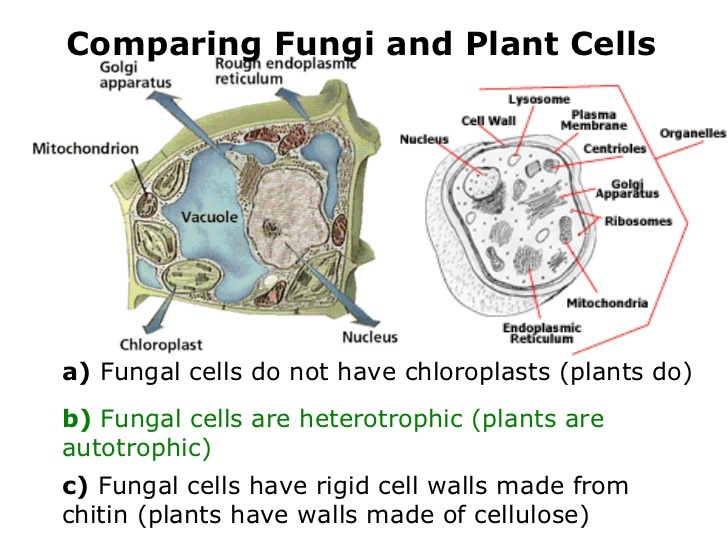 All Fungi are Heterotrophic = (do not contain Chloroplasts) so cannot make their own food, so have to obtain food from the organic matter made by others. They are further classified as Saprotrophic or Parasitic. Saprotrophs feed on dead and decaying matter - so have a key role in the recyling of nutrients and Parasites feed on living material, many cause disease to plants and animals Eg: athletes foot, thrush and Potato rot. 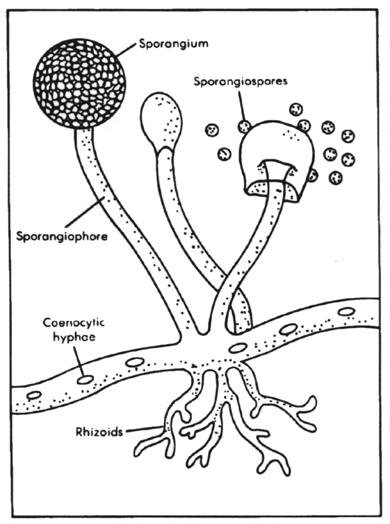 This diagram shows the structure of Rhizopus - a common mould often found growing on bread and rottting fruit. 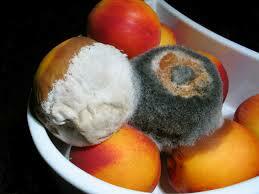 Before its food source is used up a fungus must reproduce itself and disperse offspring to other food sources. 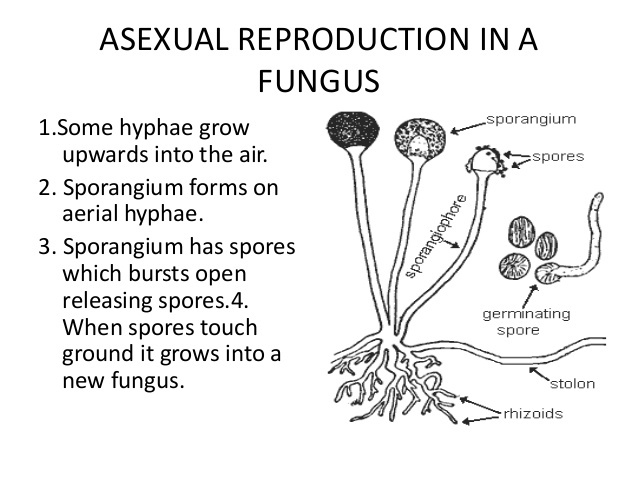 Fungi mostly reproduce asexually - offspring are produced by Mitosis (some can reproduce sexually as well). When ready to reproduce the hyphae extend vertically and produce swellings called sporangia (sporangium=singular) at their tips. 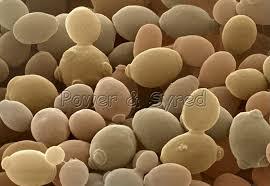 Inside are a large number of spores is produced - these are gentically identical to the parent. The spores have a tough, waterproof wall so they can resist drying out. Terrestrial Fungi rely on their spores being dispersed by the wind - their tiny size means they have a large surface with which to catch the air compared to their tiny mass, so they are easily carried on air currents. When mature and conditions are favourable the sporangium bursts releasing the spores, once they land on a suitable food source they will germinate and from a new mycelium. They are heterotrophic and digest their food externally, absorbing nutrient molecules into their cells. Fungi feed by extra-cellular digestion. They release digestive enzymes out through their feeding hyphae onto their food, these then catalyse and break down the complex larger compounds into smaller, simpler molecules which are then able to be absorbed back in through the hyphae. These are then used as raw materials for growth or in respiration for Energy. Like any living thing Fungi produce waste too !! These substances can be harmful or beneficial. Eg: Fungi can spoil food and make it dangerous to eat - Aspergillus produce a cancer causing toxin when growing on peanuts. 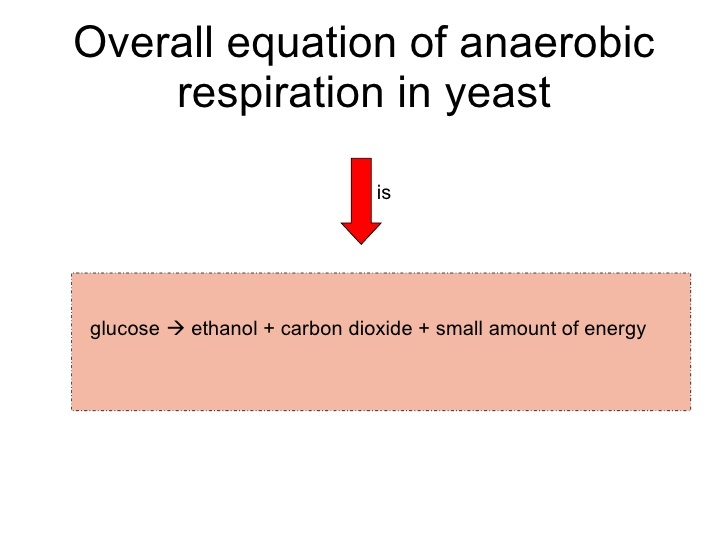 Eg: Yeast cells ferment Glucose producing carbon dioxide and ethanol - the carbon dioxide is used in brewing and bread making and the ethanol in the brewing industry. 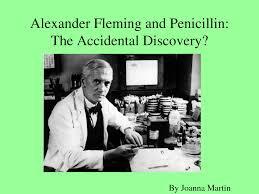 Eg: Penicillin is produced by Penicillium Fungus click here to learn more about Alexander Fleming and this amazing discovery !!! Enzymes and waste (toxins) produced as Fungi feed, lead to food spoilage ....eeekkkk nice pics Miss...not..
﻿Check this out﻿ - NZQA asessessment schedule in relation to describing Fungi and bacteria on Agar. 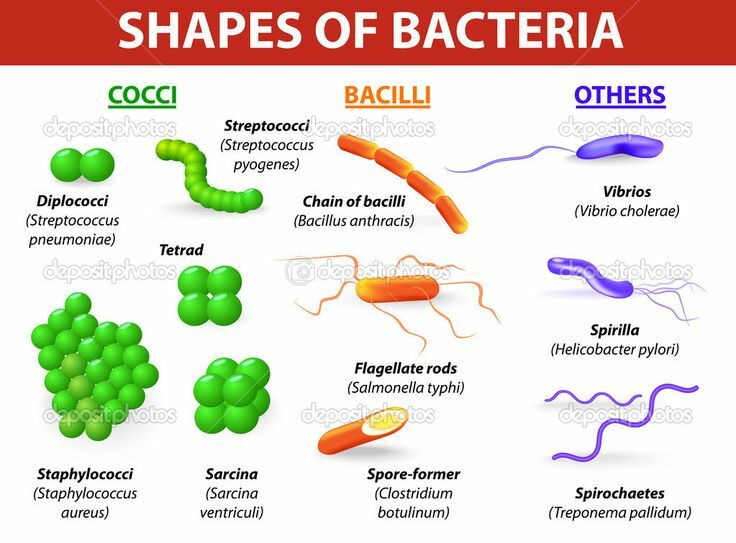 ​Bacteria are commonly rod shaped or spherical (cocci). Bacteria feed by Extracellular Digestion. Digestive enzymes are secreted out through the cell membrane onto a suitable substrate or food source. These digestive enzymes break down the food particles until they are small enough to be re-absorbed back through the cell membrane. The digested food particle s are actively pumped back across the cell membrane into the bacterial cell by a process called Active transport. The Cell membrane is also termed a Plasma Membrane - this is semi-permeable - this means that it lets some substance through and not others (like a sieve) so controls or regulates the internal environment of the bacteria cell. TOXINS - the waste products from bacteria feeding and digesting - are termed TOXINS and this is what makes us feel unwell. Bacteria reproduce by "splitting into two" - this is termed BINARY FISSION. Under ideal conditions one bacterial cell will split into two every 20 minutes ie: the population will double 3 times every two hours. This rapid growth is referred to as Exponential Growth Rate"
Culturing Bacteria and Fungi on AGAR !! Bacteria / Fungi need food / nutrients / moisture for growth which the agar plate provides. • Bacteria colonies are shiny, glossy like "droplets of paint"because they have slime / shiny capsules. 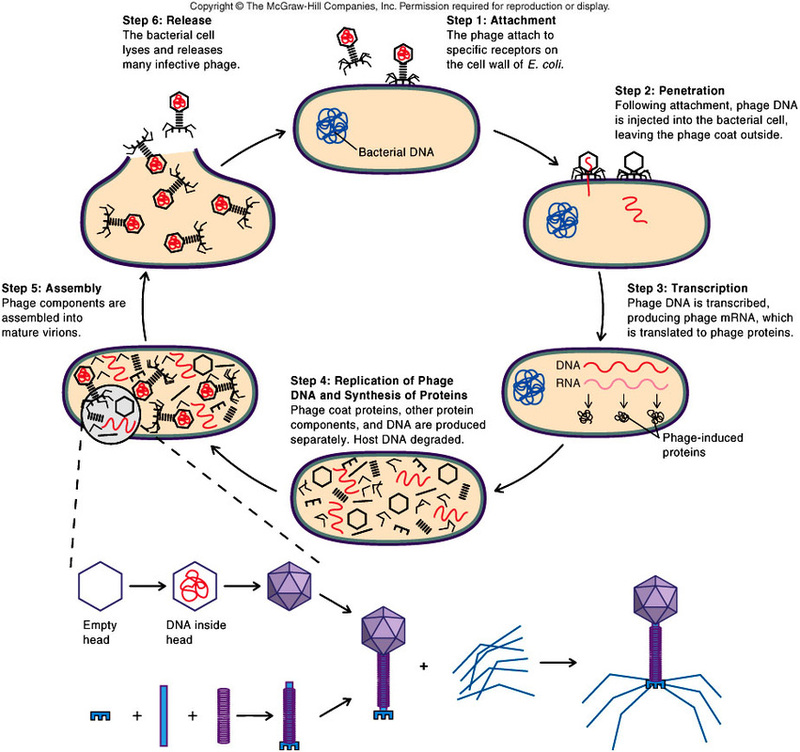 Viruses need a LIVING HOST cells to reproduce / replicate them, and so cannot grow on an agar plate. BOTH Bacteria and Fungi carry out Cellular Respiration....this means that they breakdown Glucose to release the ENERGY trapped inside. 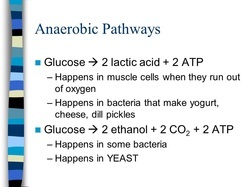 They both can carry out this process in the presence AND absence of oxygen so Aerobic and Anaerobic Respiration !! 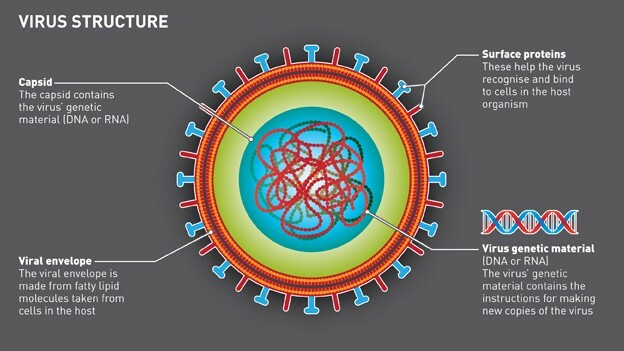 All Viruses are PATHOGENIC because they destroy the host cell once they have invaded the host cell and injected their DNA into that cells nucleus. 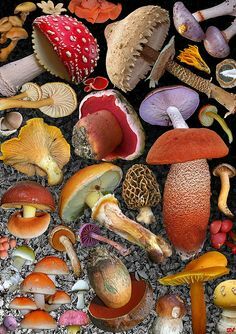 Fungi and Bacteria break down/ feed on dead organic matter/ wastes containing carbon/ nitrogen/ amino acids/proteins. The carbon cycle is the cycle of carbon usage through the earth’s ecosystem. The cycle begins with photosynthesis where plants use CO2 to produce sugars. This carbon is either incorporated in the plants tissue as carbohydrates, proteins and fats or is released during respiration. Herbivorous animals eat these plants and most of the carbon is released during their respiration while the remaining is stored in their animal tissue. Carnivores receive the carbon in the herbivore's animal tissue when they feed on them. Eventually, the carbon compounds are broken down by decomposers and are released as CO2 during the decomposer's respiration process, ready to be used again by plants. The nitrogen cycle is a natural cycle in which nitrogen from the air enters the soil, becomes part of a living organism before returning back to the atmosphere. The element nitrogen is part of protein molecules which are important in cell processes. Air is composed of 78% nitrogen however, nitrogen is unreactive thus it needs to be converted to a chemically usable compound in order to be used by a living organism. This is done through the nitrogen cycle, where nitrogen gas is converted to ammonia or nitrates. Plants absorb the nitrate compounds in the soil and animals eat these plants containing nitrogen.The BACTERIA help to convert the nitrogen in amino acids/ proteins into ammonia/nitrates. These nutrients can then be absorbed by plants from the soil (as nutrients). 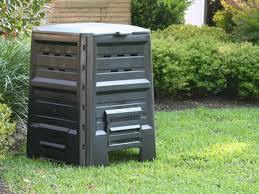 Microbes play a really important role in the decomposition of organic waste (compost) and sewage. 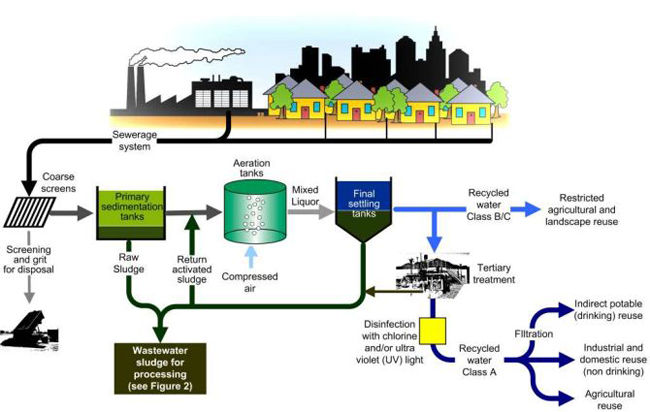 A variety of Microbes are involved in sewage treatment – both Aerobic and Anaerobic. The treatment of Sewage is important for a number of reasons. It prevents the spread of diseases –as bacteria that cause disease leave the body in faeces and must be prevented from getting in food or drinking water Eg: Typhoid and Cholera. If sewage gets into waterways such as river- it greatly reduces the oxygen content of the water, killing fish and other aquatic life. Sewage has a very unpleasant smell. 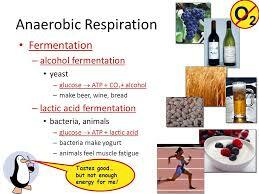 • Aerobic bacteria survive / reproduce / feed on the organic material in the aeration tanks ie: carry out Aerobic Respiration. • The bacteria carry out aerobic respiration as they feed on the contents. The ideal temperature for reproduction of microbes is around 20-40°C. At this temperature, bacteria can reproduce once every 20 minutes. Temperatures above 100°C will kill all microbes as their enzymes that control all life processes get DENATURED. LOW Temperatures means their activity rate is slowed down. Freezing will kill microbes, it will stop its reproduction. Microbes will continue to reproduce in low temps like a refrigerator, only at a slower rate - Respiration does not occur at a rate effective enough leading to insufficient energy for all other life processes included growth, reproduction and excretion. Water is a limiting factor in the growth of bacteria. Bacteria are about 80-90% water thus they need water to grow. 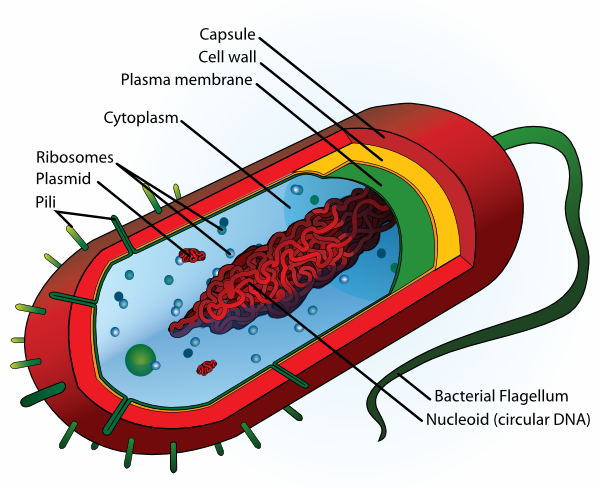 If too much water passes into or out of a bacterial cell, the cell dies. All living things require a moist environment because essential cellular reactions like RESPIRATION occur within the liquid cytoplasm. Lack of water causes desiccation and death o f Microbes. For example, if a bacterial cell is placed in a highly concentrated solution of salt water, water begins to pass out of a cell and into the salt water. The cell begins to shrink and is unable to carry on normal life functions. It cannot grow and will eventually die. In order to respire, bacteria and fungi need food. These combined with oxygen (aerobic respiration) or without (anaerobic) form carbon dioxide and water (aerobic) or carbon dioxide and alcohol (anaerobic). When nutrients run out, all other life processes are affected as the "Energy" obtained to carry out these is affected Eg: the reproduction of bacteria or fungi stops and they begin to die out. The pH (acidity or alkalinity) of the environment affects the survival of bacteria and fungi since they do not have any mechanism to adjust their internal pH. Microbes survive at around a neutral pH. Microbes will not survive in conditions too acidic or too basic as these may affect or denature the digestive and respiratory enzyems with a consequent on all life processes ! The availability of oxygen affects the respiration of aerobic bacteria or fungi. Without oxygen such as in vacuum packaging, microbes will not survive. 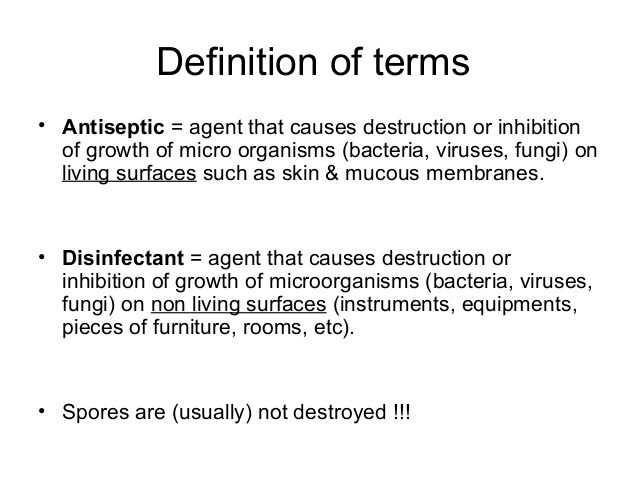 Disinfectants generally cause death of micro-organisms. so no life processes can occur. Many antibiotics affect the growth of bacteria because they prevent the bacteria from making Proteins. Some bacteria and fungi excrete TOXINS that are poisonous to other microbes and these die..ie the may have an antibiotic affect. How do our modern day food preservation techniques interfere with the life processes of our Microbes ?? If Microbes do get into the body there are further mechanisms designed to prevent them from spreading – this involves our Immune system. Our Immune System is made up of a network of cells, tissues and organs that all work together some of which includes our bone marrow, lymph nodes, lymphatic system and spleen. Our bone marrow is where immune cells "White blood cells" are produced - the special name for white blood cells is LEUCOCYTES. T – Lymphocytes - destroy and kill foreign cells/invaders and remain "on guard" as memory cells in the future to help out other immune cells. Pus: Is a mixture of phagocytes, tissue fluids and unwanted microbes. Antibodies - Are PROTEINS that destroy or neutralise invading pathogens and are produced by our Lymphocytes ! They function by sticking to the Antigen of the Microbe and cause them to clump together. Phagocyctes can then engulf the "marked/clumped" pathogen. Antigen – is unique chemical maker/signature that is on the surface of microbes/invaders and is able to be recognised by the Lymphocytes. Each Antibody produced is specific to each specific antigen and is produced in response to presence of the Antigen !!! Other terms we use for Immunity is Passive or natural Immunity. 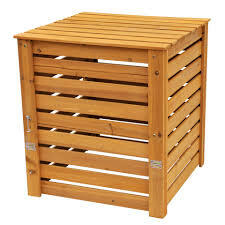 See tables below. Vaccines help develop immunity by imitating an infection, but this "imitation" infection does not cause illness. It does, however, cause the immune system to develop the same response as it does to a real infection so the body can recognize and fight the vaccine-preventable disease in the future. 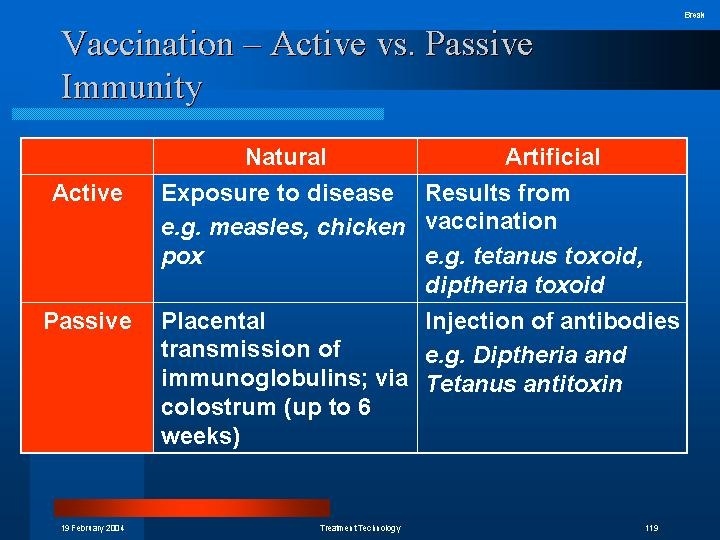 Vaccinations are an example of Passive Immunity. Vaccines - read more here ! The Greek word anti means "against", and the Greek word bios means "life" (bacteria are life forms). They are INEFFECTIVE on viruses. 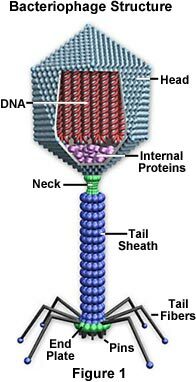 Blocking the cell's ability to create proteins by attaching to ribosomes in the cell. Deactivating a bacterial enzyme (transpeptidase) that builds and repairs the bacteria wall. Activating a bacterial enzyme (autolysin) that cuts open parts of the bacterial wall, an enzyme normally only activated when the bacteria is multiplying. 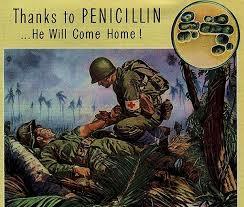 Penicilin was the first Antibiotic medicine produce and used to treat bacterial infections. Penicillin is now produced in large quantities by the process of fermentation from Mould- Penicillin - or produced synthetically in a lab. Antibiotics are not effective on Viruses WHY ???? Simply put, antibiotics cannot kill viruses because viruses have different structures and replicate in a different way than bacteria ie: they do not have a cell wall and most Antibiotics work by interfering/destroying the cell wall/membranes of the Bacteria ! Antibiotics can also work by targeting the growth machinery in bacteria (not viruses) to kill or inhibit those particular bacteria. WHY do we have Antibiotic Resistance?? Antibiotic resistance occurs when bacteria evolve in a way that reduces or eliminates the effectiveness of antibiotics. The misuse and over-prescription of antibiotics has led to a dramatic increase in the incidence of antibiotic resistance. In any population of living things we have natural VARIATION - this natural variation means that some bacteria in a population may carry alleles that give them "resistance" to a specific antibiotic. So these bacteria that carry the alleles for resistance are NOT killed by the antibiotic - so they go on to reproduce, producing more bacteria that are also resistant !! Over time the whole population can become resistant to that particular antibiotic so anther antibiotic must be found to kill members of this bacterial population. Extensive use of antibiotics encourage the development of antibiotic- resistant strains. 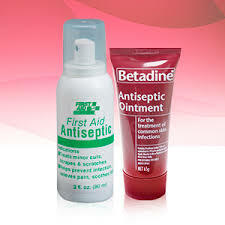 antibiotics and in the process encourages the development of resistant bacteria. Viruses like the common cold are very difficult to control...why...because they can mutate and change their protein coats and DNA so frequently...this means different strains ! So what.....this means that is it very difficult for the Immune System to "recognise" the Virus and therefore makes it really difficult for the Immune System (white blood cells) to make the antibiotics to attack the common cold virus.